"The first device that benefited from our Wireless Charging technology was Joya Touch device - Our success there was beyond our expectations, confirming the benefits that Wireless Charging technology can offer to end users," explained Giulio Berzuini, General Manager Retail Industry, Datalogic. Gryphon scanner features the Datalogic Wireless Charging System, a ground-breaking new feature for enterprise devices; Datalogic is the first manufacturer to offer this technology in rugged mobile computers and handheld scanners. Based on inductive-charging technology now widespread in numerous consumer electronic products, Datalogic’s Wireless Charging System eliminates battery contacts and pins, that often get dirty, bent, or broken over time – and this removes a key point of failure for devices used in industrial and retail functions. Routine charging system maintenance and cleaning procedures are eliminated which means lower down time, and a lower TCO for Datalogic systems. Datalogic’s Wireless Charging System is also faster than traditional charging solutions. Battery levels can be safely and rapidly “topped-up” between shifts, and fully-recharged in the shortest possible time – all without over-stressing contacts, pins, and cables. For devices used round the clock, or with only short breaks between shifts, this is a great operational advantage. “Datalogic has always been at the forefront of innovation. We were the first vendor to introduce “Green Spot technology” for the visual confirmation of correct barcode reads, and with Linear Imaging replacing older laser-scanning technology. The first device that benefited from our Wireless Charging technology was Joya Touch, our device for the self-shopping. Our success there was beyond our expectations, confirming the benefits that Wireless Charging technology can offer to end users. We have indeed witnessed a clear reduction in the typical amount of reserve terminals required by customers (when dealing with common recharging issues), so we decided to apply this technology to other product families as well”, explained Giulio Berzuini, General Manager Retail Industry, Datalogic. While the Retail POS checkout is the natural environment for this product, the variety of options, the rich features set, and Gryphon™ overall ruggedness, opens the doors to many applications in Light Manufacturing, Access Control and Entertainment industries, where advanced scanning and high-reliability are required. The Healthcare version of Gryphon 4500 features disinfectant-ready and anti-microbial enclosures, to withstand harsh daily cleaning procedures. This does not allow bacteria to lodge on the enclosure. This feature, together with the clarity of the Green Spot technology and vibration function, and the capability of reading different barcodes, make the Gryphon 4500 series scanners a great choice for Healthcare applications such as in laboratories and bedside point-of-care. 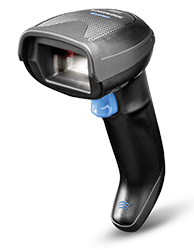 Renowned as one of the most popular and effective barcode readers since first introduced in 2009, many millions of Gryphon™ scanners have been deployed throughout the world, across all major applications. A solid and proven design updated with cutting-edge new technology to meet demanding operational needs. The new Gryphon 4500 wireless series adds communications options featuring Bluetooth® radio technology or narrow band radios compatible with Datalogic’s STAR Cordless System™. Datalogic and the Datalogic logo are registered trademarks of Datalogic S.p.A. in many countries, including the U.S.A. and the E.U.. Gryphon is a trademark of Datalogic S.p.A. and/or its affiliates, registered in the U.S.